This is a 6-hour seminar and workshop that reviews the challenges of the modern firefighters “playing field” and movement patterns and assesses the essential workout components that will help improve performance and reduce injuries. 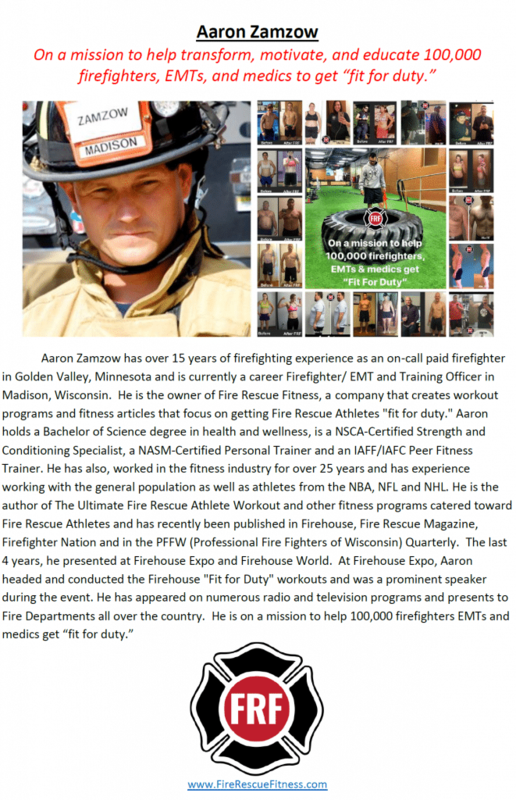 Attendees will review the essential components of an effective fire rescue athlete workout program and learn how to create workout calendars to adequately meet the high physical demands of the job. The seminar will also teach creative and effective ways to create daily workouts for members of their department and crew. Attendees will have the opportunity to create programming with other attendees based on instructor lead scenarios. -Attendees will learn the challenges of the firefighter “‘playing field” and the common movement patterns of the fire rescue athlete. – Attendees will learn how to create workouts that contain the essential components using simple equipment found around every firehouse. -Attendees will get the opportunity to create usable workouts to take to their department based on instructor lead scenarios.